The clicker is a small hand-held tool which makes a clicking noise. The clicker is simply an effective hands-free way of communicating with animals. It is a very distinct, unamibiguous sound (CLICK!) that tells the dog that what he has done (or is busy doing) is right and there is a reward to follow. The clicker bridges the gap between the behaviour and the reward. It is not a magic “quick fix”, although in the hands of an experienced clicker trainer it looks magical. More precise at identifying behaviour or parts (splits) of behaviour. For example, if you want to reward your dog for making eye contact with you, you can catch the precise moment that his or her eyes meet yours. The dog then understands that it is that brief contact that is being rewarded. If you train only with food and lures the timing is difficult, as the second you move your food hand to reward that momentary eye contact, the dog will look at the hand holding the food hand and looking away is what you are actually rewarding. Allows for a time lag before delivery of the primary reinforcer. Because you have associated the clicker with the presentation of food (the primary reinforcer), the dog understands that the click predicts that the reward is on its way. Allows for treat delivery to be more flexible. Depending what you are trying to achieve in your training the treat delivery can be while the dog is in position (if you are working on sustained positions) or if you are training for some activity such as going out to touch a target and returning to you, the contact is clicked, but the dog has to return to you to get the treat. Allows for easy resetting of the behaviour. When you are working for repetitions to build fluency, the treat can be tossed away from the dog so that the behaviour is reset, The training session becomes more efficient. Affects Demeanour. Tossing the treat after the click can activate a passive dog whereas feeding in position can calm a busy dog. Enables movement to be marked and reinforced. For example, you can click the dog while it is moving towards you, and even though you are delivering the food when the dog gets to you, it knows that it is the movement towards you that is actually being rewarded. Allows for distance building. 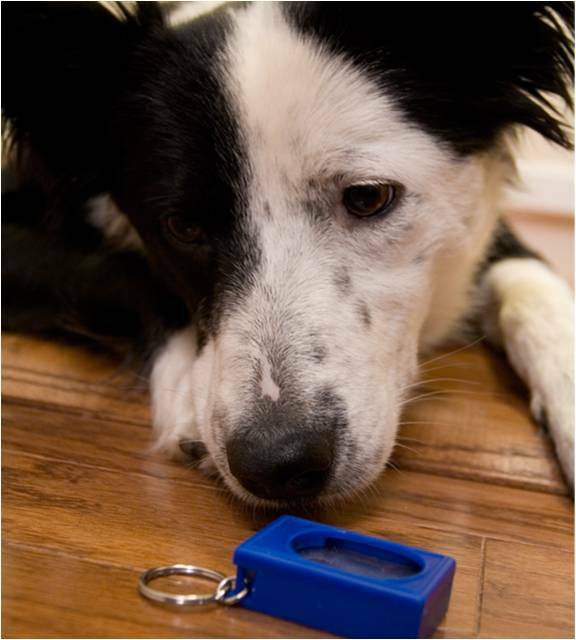 The clicker is useful when teaching the dog to sit or lie down at a distance or to touch a target at a distance. Some of the difficulties a lot of people have with using the clicker is the timing. If the click is even slightly late, you might be reinforcing some other behaviour than you thought you were. You get what you click for. However, this timing can be practised without your dog and we all know that practice makes perfect! I will describe some of these games in a subsequent post. Dogs, even dogs that have never heard the click of the clicker before, take to it incredibly quickly. It makes teaching your dog a breeze and fun for both of you. It teaches your dog to think – and think they do. There’s nothing more exciting than to see your dog have that “Eureka” moment when it knows exactly what you are clicking for.